3 members of the Electoral College to which the District of Columbia became entitled under the 23rd Amendment (ratified in 1961). 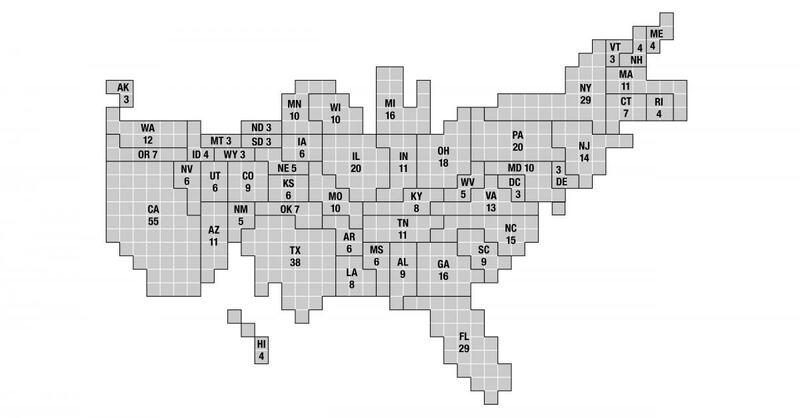 Every 10 years, the 435 U.S. Representatives are reapportioned among the states in accordance with the latest federal census, thereby automatically reapportioning the membership of the Electoral College among the states. Each political party nominates its own candidates (typically long-standing party activists, officeholders, or donors) for the position of presidential elector. Most nominees for the position of presidential elector are nominated by district and state conventions of political parties. Some are nominated in party primaries. There are a variety of other methods used. For example, in Pennsylvania, the presidential candidate himself or herself directly nominates their presidential electors. Members of the Electoral College are elected by each state and the District of Columbia on the Tuesday after the first Monday in November in presidential election years. Forty-eight of the 50 states elect their presidential electors using the so-called "winner-take-all" rule -- that is, 100% of the state's presidential electors are awarded to the candidate who received the most popular vote inside each state. In Maine and Nebraska, one presidential elector is elected from each of the state's congressional districts. Thus, in 2008, Nebraska's electoral votes divided 4-1, with McCain receiving four and Obama receiving one (as a result of his winning Nebraska's 2nd congressional district). In 2016, Maine's electoral votes divided 3-1, with Clinton receiving three and Trump receiving one (as a result of his winning Maine's 2nd congressional district in the northern part of the state). The 538 members of the Electoral College cast their votes for President and Vice President in meetings held in the 50 state capitals and the District of Columbia in mid-December of presidential election years. If all 538 electors are appointed, 270 electoral votes (i.e., a majority of 538 members of the Electoral College) are required to elect the President and the Vice President. 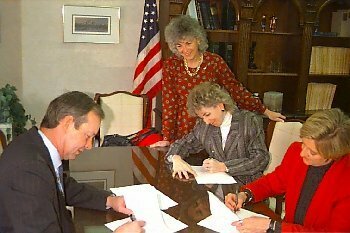 The three North Dakota members of the Electoral College met on December 15, 2000, in Bismarck to cast their votes for the Bush-Cheney ticket. Gov. John Hoeven (left) observes former Gov. Ed Schafer put his signature to ballot for Electoral College. The other two electors are former state Senator Bryce Streibel of Fressenden and former Lieutenant Governor Rosemarie Myrdal. The three Wyoming members of the Electoral College met in December 1996 in Cheyenne to cast their votes for the Robert Dole for President and Jack Kemp for Vice President. The date for the meeting of the Electoral College is established by federal election law (United States Code. Title 3, chapter 1, section 7). In 2004, the designated day for the meeting of the Electoral College was Monday, December 13. This statute was enacted in 1934 after the 20th Amendment changed the date for the presidential inauguration from March 4 to January 20. In 2000, the U.S. Supreme Court in Bush v. Gore reiterated the principle that the people have no federal constitutional right to vote for President or Vice President or for their state’s members of the Electoral College.. The Constitution’s delegation of power to the states to choose the manner of selecting their members of the Electoral College is unusually unconstrained. It contrasts significantly with the limitations contained in the Constitution on state power over the manner of conducting congressional elections (Article II, section 4, clause 1). Certificate of Ascertainment showing that Wyoming cast its three electoral votes for the Bush-Cheney ticket because that slate of candidates received more popular votes in Wyoming than any other slate.